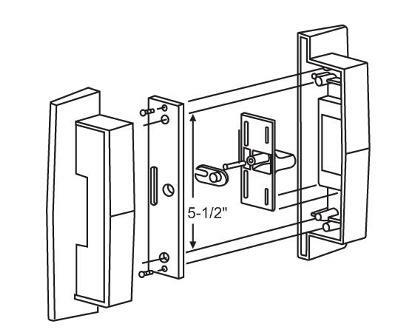 Sliding glass door locks such as the steel mortise style locks shown on this page are used in wood, vinyl and aluminum patio doors. 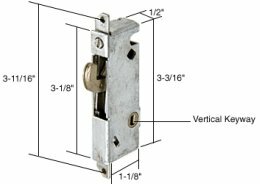 They are often used in higher end doors because steel mortise locks are more secure than the cast aluminum alloy versions used in many patio doors. 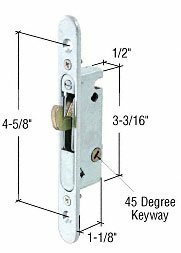 The important thing with mortised locks, and any sliding glass door lock really, is getting the right description by taking dimensions or, even better by taking a digital photograph to use in finding the right lock. There are quite a lot of steel mortise locks and it is often hard to tell the differences between one and another. The mounting hole locations, the direction of swing of the hasp and the size of the hasp are all important details to know. If the lock you have is built right into the frame of the door, you most likely have a mortised lock. The aluminum door varieties usually sit in a recess cut into the patio door frame. 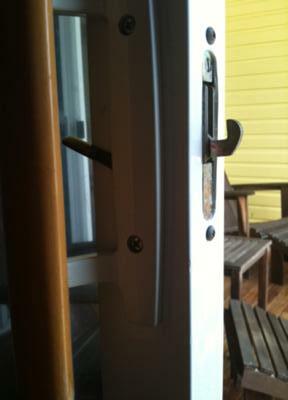 Wooden patio doors have steel locks mortised into a pocket in the door. On some sliding glass door locks the door handles have long screws that go right through the steel mortised lock and there is usually a actuating lever that slides into a rectangular hole in the lock. Usually you buy just the mortised steel lock assembly that fits within the door and reuse the old handles and actuating lever. There are small parts with these locks so do not lose any while taking it apart! There are many different kinds of steel mortised locks but there are a few common types. 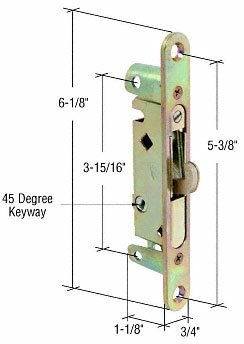 Heres information you need to have to source a new mortise lock. End Face Plate type (round or square). Screw Hole Size The distance between the centers of the mounting screw. Name of the Manufacturer of the door to which a particular lock is unique. Position of the keyway, more information on that below. If you do not have enough information, take a picture of the lock with your digital camera, this can be really helpful when trying to communicate which kind of lock you are looking for. On a mortise latch there is usually a knob mounted in the handle of the patio panel with a long rectangular key. This rectangular key fits in the keyway indicated on these pictures. 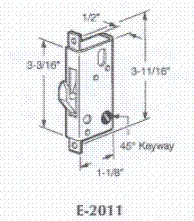 When you are replacing a mortise latch, you have to take note of the position of the keyway. Some are vertical, while others are angled at 45 degrees. <br><br>Pick the wrong type and the sliding glass door locks will not operate properly. What if your lock is no longer made ? 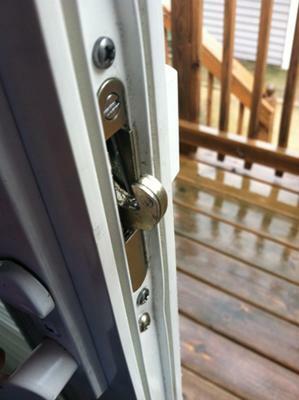 One of the problems you may run into is that the lock your patio door uses is no longer made. In those situations there are products that can help. 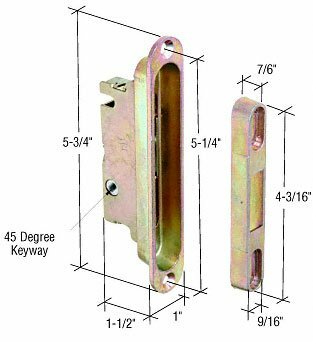 The do it yourself surface mount lock by Cal-Tech shown below offers excellent security and can be installed on just about any sliding patio door. E2011 is no longer available. 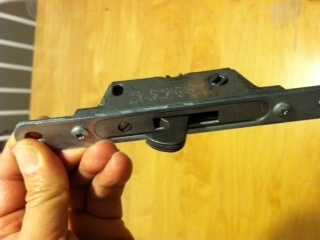 It has no latch adjustment screw and actually has a vertical keyway, not the 45 degree shown in the picture. (sorry old catalogs are not always accurate !) E2012 has the same overall dimensions and shape and can be used to replace it. These locks are identical except for the position of the keyway. One has a vertical keyway, one has the keyway at 45 degrees. The last version has the keyway at 22-1/2 degrees. You will often find these on patio doors made by Adams Rite and Arcadia as well as a wide variety of other manufacturers. The sliding glass door locks above all require different sizes of rectangular cutout for the hasp in the patio panel. The mounting screws are all placed above and below the cutout. This lock made for an oval shaped cutout is probably the most popular and widely used of all mortise locks for patio doors. These locks are identical except for the position of the keyway. one has a vertical keyway and the other has the keyway at 45 degrees. E2126 requires a 3/4" wide x 3-7/16" oval cutout in the patio door and E2079 requires a 5/8" x 3-3/8" oval cutout. 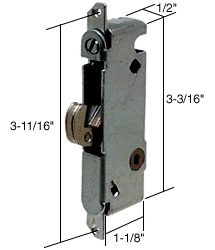 As well, both of these sliding glass door locks are assemblies consisting of three parts. An E2105 mortise lock, a recessed housing or escutcheon plate and a lock hasp. 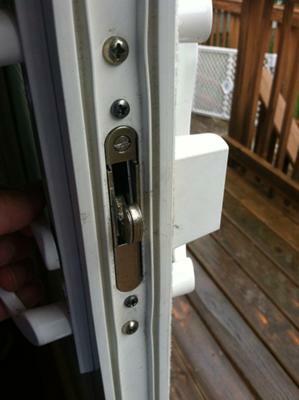 Usually its the E2105 lock that breaks so you might not need to buy the whole sliding glass door locks assembly, just the lock. 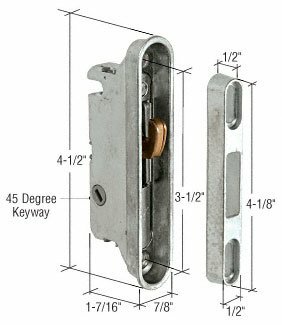 The recessed housing is often used to mount these locks in wooden or vinyl patio doors as the housing allows bigger screws to be used. Locks E2469 and E2487 are assemblies consisting of three parts. An E2014 mortise latch, An oval shaped housing and a separate hasp. Usually, its only the E2014 mortise latch part that breaks, so you might not need the whole assembly. These sliding glass door locks are also assemblies consisting of an E2014 lock and a flange or escutcheon plate. The escutcheon plate is there to make it easy to install the latch in wooden doors. The plate has holes for wood screws allowing the whole assembly to be screwed into a mortise cut in one of the vertical stiles. The flange or plate usually does not break and you can easily change out the E2014 lock just by removing the 2 small mounting screws if you dont want to buy the whole assembly. These sliding glass panel locks are different in that the actuator lever and the lock are combined in one. All the other locks mentioned on this page have a seperate lever that gets inserted through the keyway. The sliding glass panel locks above both share the same mounting screws that hold the handles together on both sides of the patio panel. The E2105 lock is used in the E2126 and E2079 assemblies on this page. Locks such as the E2025 were used on Arcadia 700 and 800 series patio doors made during the the 1970's and 1980's. 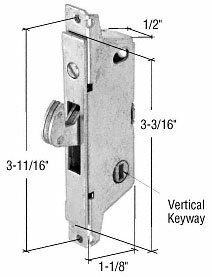 They are a little different from other mortise locks on this page because the hook is mounted stationary on the side jamb of the door. When the door is closed the whole mortise lock slides down over the hook. Sort of a "dont raise the bridge - lower the river approach"! 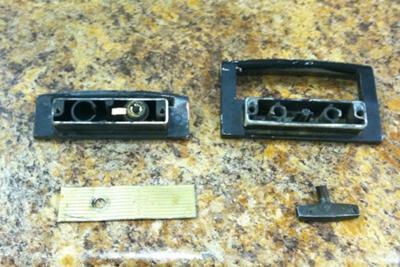 The pictures above are by no means all the mortise locks used in patio doors, these are just the more popular ones. This is a sampling of some of the questions I get about mortise lock installation and repair. How do I know if I need to the 2014 or 2013 replacement lock for my patio panel? You need to remove the handleset to see how the thumb lever fits in the lock. GREAT web site and source of information. On your home page, you have a picture (lock #5) on the right side. I'm attempting to replace one for a client- can't seem to get the old one out. I've removed the screws and tried pushing the lock into the door rail hoping to get it to slide up OR down where the screw mounting holes would get passed the mortise opening and allow me to remove it- it doesn't budge. Found a new lock at a local glass company, but they couldn't give me any hints on how to get the old one out- must I remove the frame from the glass? Can if I have to, but would rather not!! Any advice would be appreciated. Hi Tony, happy to help in any way I can. Any chance that you could take some digital pictures of the lock and email them to me. Once I see what we are dealing with I might be able to help. We had a locksmith come and look at our sliding padio door lock. He quoted me $189.00 to order the lock and replace it. I thought that was insane and told him I'd find a way to fix it myself. I found your website and it looks like you might have the lock I need. Can you identify what replacement lock this would be? Thanks! Thanks for the question. Your lock is most likely the E2014 or the E2013 shown on my sliding door lock page. Usually its the E2014 but the only way to be absolutely sure is to loosen the two screws that hold the handle on. You have to remove the handles to see how the small actuator lever enters the latch. On the E2014 the actuator lever is at an angle of 45 degrees. 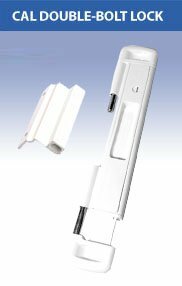 In patio door handles that have the E2013 the actuator lever is bent or twisted so that it enters the side of the lock vertical. The E2014 is much more common but you really cant be sure unless you take the handle off and look at it. If you are still not clear just upload a picture of the latch once you have the handle off and I will help identify it from that. I have attached a picture, do you have anything like this? it is really heavy, maybe made of brass and also it has mounting holes that are 3 1/4"
It took a while for me to dig this one up, sorry for the delay. I posted a picture from the old catalog which appears to be very close to what you have. Take a look and see if you agree, and let me know if the 5-1/2" dimension makes sense. It looks like its designed to have both 3-1/4 and 5-1/2" mounting holes. If all looks good I will see if its possible to get one of these handles for you. The latch on my patio door is not engaging the mount to latch the door. (see brace pic) The latch on the door is functioning; however it doesn't seem to be catching the mount, and when it is in it's locked position, one can easily pull the door and it opens. I'm not sure if it is a door issue or a latch issue. I do not want to buy a new patio door if this is a simple fix. Any help or advise is greatly appreciated. Most of the time, this happens when the patio door is not 100 percent aligned with the side jamb or door frame. Open the sliding door just one inch so that light just starts to come through. Sight up and down the crack and see if the door looks parallel to the side frame. You might need to adjust the rollers on the bottom left or the right to get it perfectly square. Once you do that the latch may start working. Regardless the door needs to be square before the latch is adjusted. With the door perfectly square, take a piece of masking tape and align it at the top of the opening in the latch keeper mounted on the side jamb. Wrap the tape around the inside so you can see the level of the top edge even when the door is closed. Now almost close the door and extend the hasp and see how far up or down it is from the bottom edge of the masking tape. If the bottom of the latch hasp aligns thats great but you might need to adjust the screw just above the hasp to get it to move up or down. The last thing to try is to install a couple of washers behind the latch keeper on the side jamb. 1/8 inch should be fine. One of these things should get that latch working again. If not, try a new mortise latch. Can you tell me which mechanism I should be ordering. I have attached a couple pictures that should help? Thanks for the pictures. Your latch is most likely my E2014 but to be 100 per cent sure you would need to remove the 2 screws that hold the handle on. That would allow you to see if the slot in the latch that the actuator lever fits into is 45 degrees to the vertical. If its not, and the slot is horizontal, then the lock is an E2013. The slot position is the only difference between the two locks. The latch will not fall out if you remove the handle. The latch itself is held on by the two screws above and below the latch. The actuator lever on the handle is usually a small metal strip bent at 90 degrees so it goes into the slot on the side of the latch. The door handle on my sliding glass patio slider broke so I needed to replace it. I did not replace the parts recessed in the frame, just the indoor handle and the outdoor pull. The latch box is the rectangular cut-out type. Since doing so, the door won't stay latched. What can I do to adjust the the tongue of the latch so it catches the latch hasp tightly? One thing that might be causing a problem is the thickness of the handle. 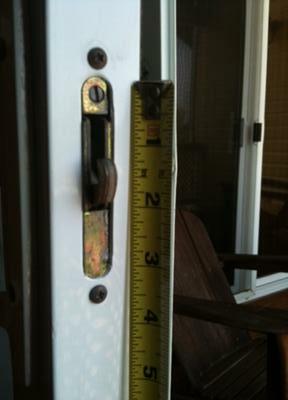 The patio door usually slides into the side jamb 1/2" to 3/4" when closed. Is the new handle closer to the edge than the old one was ? Is it preventing the door from closing all the way into the jamb ? That would make the sliding panel further away from the hasp and might explain why it does not close. You can experiment by putting washers or a shim behind the hasp on the jamb and seeing if it locks again. Another thing to check is to make sure the sliding panel is perfectly parallel with the jamb by adjusting the rollers. 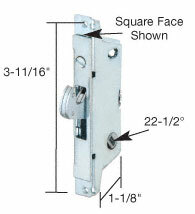 If the panel is not parallel, the top or the bottom will fully close but there will still be space at the hasp and prevent the lock from engaging in the hasp. 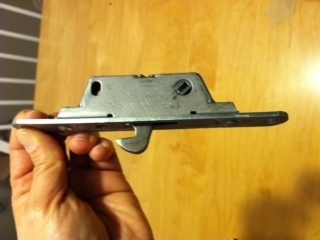 Hello, can you please help us identify the correct latch to order? The manufacturer does not sell the latch. The handle broke off. Our screen is also ripped. Mortise Lock with a "Gap"? Finding a replacement sliding door handle! 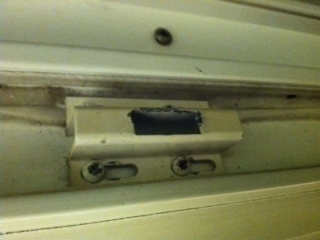 Mortise Lock Broken and Door is Locked - Miracle needed! Oops! Should have left the screws in! I promise to use it only to send you The Screen-Zine.